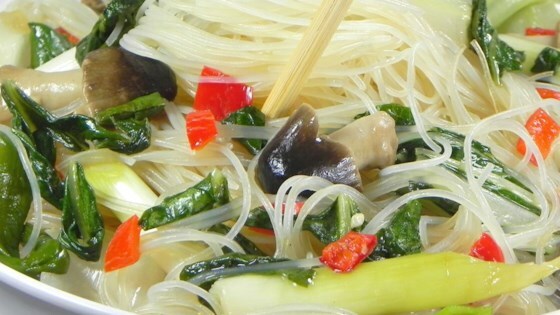 "A delicious twist on noodles if you are getting tired of the spaghetti routine. If you can't find fresh rice noodles, cooked dried rice noodles work just fine. Dried rice noodles, as well as fresh rice noodles, can be found in many supermarkets as well as Asian markets. You can use sherry in place of the sake, and Chinese black vinegar in place of the balsamic, if you like." In a small bowl, whisk together the soy sauce, sake or sherry, vinegar, sugar, water and cornstarch. In a large skillet or wok heat the oils over high heat. When the oil is nearly smoking, add the garlic and hot peppers. Take the skillet or wok off the heat after 10 seconds. Reduce the heat to medium-high and return the skillet or wok to the heat. Add the ginger, bok choy, shiitakes, and green onions; cook for 3 minutes over high heat, stirring constantly. Add the fresh or soaked rice noodles and the soy sauce mixture; cook 2 minutes more or until the noodles are hot and tender. Serve the noodles immediately, topped with the toasted sesame seeds. I read the reviews beforehand and was glad i only used 1 packet instead of 2 for the noodles. Great recipe other than that!!!! This didn't have nearly enough sauce for the amount of noodles called for. Pretty tasteless as is. My husband had his boss over for dinner and he is a vegan. Worked great for the dinner party. I would make it again but I would cut the soy sauce in half.